“During his 12 years at OPERA NEWS, Robert Jacobson became a nationally prominent advocate for opera and the arts through his frequent lectures and television appearances. Mr. Jacobson's career in music journalism began in 1963 with review assignments for MUSICAL AMERICA. Over the following decade he wrote for numerous publications and edited the program booklets for Lincoln Center. He was also a regular program annotator for CBS Records. In 1974 he became editor of OPERA NEWS, and also edited its sister publication, BALLET NEWS, from 1979 until it was discontinued. During his editorship Mr. Jacobson moved OPERA NEWS, which is published by the Metropolitan Opera Guild, away from its image as a house organ. He served as the magazine's chief New York critic as well as editor, and reviewed performances at the parent house. “Gerald Fitzgerald, an associate editor of OPERA NEWS magazine since 1960 and a well-known figure in American opera, also served as an associate editor of BALLET NEWS during its seven-year existence, from 1979 to 1986. 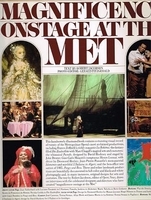 Like OPERA NEWS, BALLET NEWS was published by the Metropolitan Opera Guild. His editorial capacity with the Guild involved him in a wide variety of activities, most of them consisting of photographic documentation of the Met. 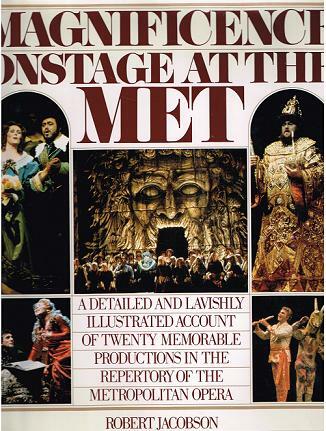 But his most important project was the two-volume revision of the MET annals. Mr. Fitzgerald served as picture consultant or editor for many opera books, among them THE GOLDEN HORSESHOE, CALLAS, CELEBRATION: THE METROPOLITAN OPERA, THE MET: 100 YEARS OF GRAND OPERA, MAGNIFICENCE ONSTAGE AT THE MET [above],THE STAGES OF MENOTTI and GRANDISSIMO PAVAROTTI. He also produced slide shows and publications for a variety of Guild functions, and intermission features for the LIVE FROM THE MET telecasts starting in 1977.